Hardy geraniums have deservedly become one of the herbaceous mainstays of most gardens. Reliable, easy-to-grow and long- flowering, there is a geranium that will grow in almost any condition a garden offers. Their popularity and fecundity has led nurseries and plant breeders to introduce an abundance of new varieties. A surfeit in fact: how many small blue flowers, often with little difference between them, can one garden accommodate? A few years ago I decided I could live without any more ‘new’ geraniums coming through the garden gate. I want to change the sign requesting no circulars and no hawkers to include ‘No More Geraniums’. Then along came plantswoman and Geranium expert Juliet Robinson, generously offering a few gifts from her garden. 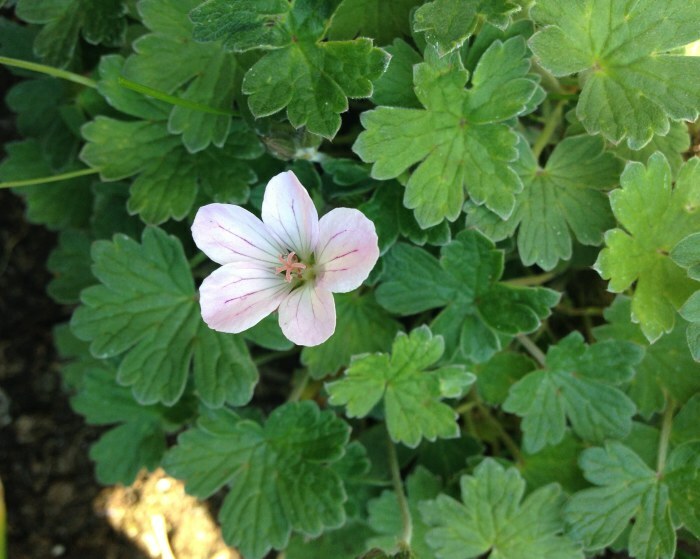 Amongst them was a piece of a pink-flowered geranium that she had found growing in a paving crack several years earlier. Geranium ‘Pink Delight’ is a low-growing, compact plant with small soft leaves that are reminiscent of Geranium lambertii but with none of that plant’s dislike of cold and wet. In May the domes of foliage are smothered in shell pink flowers that leave behind striking dark red sepals when they are over, adding to the charm of the plant. Geraniums flowering in the early summer are ten-a-penny. This one goes on and on and on until the early autumn, when it is still singing its song. Plants that flower this long are to be treasured. The reason for its long-flowering is its sterility. It produces no seed and so has no mechanism to tell it that its flowers have done their job and it can stop flowering. Only the colder weather stops it. To get the best out of it plant in a well-drained soil in full sun. Don’t crowd other plants around it as this spoils the attractive domed shape of the plant (about 10cm high) and prevents it from spreading. If you want to make more plants just dig it up in the spring and you’ll find that the plant almost falls apart into smaller plantlets that you can re-plant immediately.